The Jazz Arts Group’s Inside Track series continues to scorch the Lincoln Theatre stage on Friday, November 8 with the soulful sounds of Atlanta’s Ruby Velle & the Soulphonics. 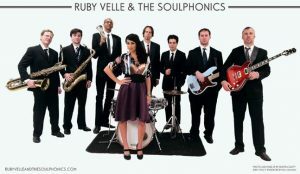 Ruby Velle & the Soulphonics roots are embedded in the rich sound and history of Georgia soul, beginning with the early ‘50s and ‘60s R&B that became so well known around the world. Having performed countless gigs since 2005, and with a slew of 45 rpm singles already under their belts, the band has already contributed heavily to the steadily increasing awareness of genuine rhythm and blues music that exists today. They pack clubs and festivals with their original brand of soul, all of which is written and recorded in Atlanta. It’s About Time, their full-length debut album, has quickly made waves around the globe since its recent September 2012 release. Billboard has recently ranked the album in the top 30 on the Heatseeker charts, a chart devoted to emerging artists. In the US, the lead-off single “My Dear” was featured as iTunes’ “single of the week,” sparking a digital soul-grab of 200,000 single downloads, and 1200 full album download sales, landing the album at #4 on the iTunes R&B charts. The same week, Jim Farber of The New York Daily News named the album in his much sought-after top ten. In addition, Google Play has offered “My Dear” as a free track for the month of October for all smartphone users. “While their recorded music is incredible not much beats the power of their live shows. To hear Velle belt out the lyrics in an intimate room to a packed house is something that must be experienced live and in person,” writes the Atlanta Live Music Examiner. Advance tickets are on sale now for $20 (general admission) and are available through the CAPA Ticket Office and through all Ticketmaster outlets. Showtime is 8:00 PM. The Inside Track series gives music lovers from all walks of life the chance to stretch their ears and stretch themselves at the newly restored and historic Lincoln Theatre. The revamped small-ensemble series will also feature CJO all-stars Byron Stripling and Bobby Floyd in the post-holiday show “Swingin’ the New Year” (December 28, 2013); Grammy Award-winning blues guitarist and film composer/actor Chris Thomas King (March 1, 2014); and the ear-bending collaboration of the New Orleans funk of the New Basics Brass Band and bluegrass of The Relentless Mules in “Brass & Grass” (April 26, 2014). Call 614-294-5200 or visit www.jazzartsgroup.org for more information.